Be the first to share your favorite memory, photo or story of Cathy. This memorial page is dedicated for family, friends and future generations to celebrate the life of their loved one. 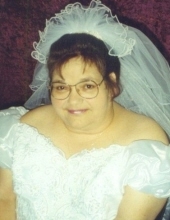 Catherine (Cathy) Gail McClelland Hopkins, 64 years old, passed away April 1st, 2019 surrounded by her loved ones. Cathy was born on January 12th, 1955, in Houston, Texas and her family settled in the Sheldon area in a small community called Beaumont Place. Cathy became a quadriplegic from polio at 18 months old in 1957, but against all odds became the first in her family to receive a Bachelor and Master’s degree in Education. With an English major, she taught at Sheldon Intermediate for four years until post-polio consumed her health. Cathy was an active member of Beaumont Place Baptist Church, teaching Vacation Bible School and enjoying working with children. Cathy met the love of her life, Russell Hopkins online in a Disabled Chatroom on AOL in March of 1998. Cathy and Russell were married on March 20th, 1999, and lived happily just shy of their fifteenth wedding anniversary. Per Cathy, and I quote, “I lived the Happily Ever After”. Cathy was preceded in death by her husband, Russell Hopkins; parents Edward “Babe” and Mildred McClelland; grandparents Johnnie and Hessie Williams; grandparents Marion Ennis and Marie McClelland; grandparent Dezzra Christine McClelland; and a host of beloved aunts, uncles, and cousins. Cathy and Russell had no children but raised two furbabies, Keke and Lottie Dah. She is also survived by loving family members, brother, Ennis Earl (Mack) McClelland and wife Freda; brother, Johnnie (Pat) McClelland and wife Janet; sister, Cynthia (Cindy) McClelland Langdon and husband Dale; as well as by nieces and nephews, Tina, Toni, Johnnie, Ronnie, Bradley, Chris, John Eric, April and Scotty; great-nieces and nephews, Brittney, Blaine, Daniel, Krislyn, Leigh Ann, Dylan, Megan, Kyle, Daniel, Angel, Trevor, Abby, Zane, Case, Colt, Trinity, BJ, Paige, Ella and Kanon. The McClelland Family would like to thank Julie Nunez for eighteen years of dedicated service to Cathy and Russell. You are welcome to join the family for a visitation from 9:00 A.M. to 10:00 A.M. on Friday, April 5, 2019 at Beaumont Place Baptist Church with funeral services to take place at 10:00 A.M. Graveside services will follow at Brookeland Cemetery. To send flowers or a remembrance gift to the family of Cathy Gail Hopkins, please visit our Tribute Store. "Email Address" would like to share the life celebration of Cathy Gail Hopkins. Click on the "link" to go to share a favorite memory or leave a condolence message for the family.